I, Simplicious of Athens, son of Damocles of Cilicia, in the year 567 A. D. do dedicate this story of my life to the great Pantheon of Gods; not that I am a believer in the gods, nor that I could admit it even if I were. No, we have just the one God now and were I a pious man prone to choose a faction (something all the rage these days) I'd certainly have chosen the one God, because one is easier to bargain with! Nevertheless I dedicate this work to the Ancestral Gods of Greece in honor of my heritage, and of the former glory of Athens. My name, Simplicious Simplisticus, has always struck me as fittingly ironic in a lifetime of ironies, as nothing whatsoever about my life or the era I've lived in has been the least bit simple. On the contrary it has already become synonymous with all things complex, inscrutable, mysterious, and in short Byzantine! So before I go on with this narrative I'd like to say my first objective in writing it has been to cast away the veil of obscurity shrouding this age, and in keeping with that aim I'd like to apologize at the outset for describing what follows as “this thing,” or “this work,” or god knows what – rather than some more appropriate title. My only excuse is that when I sat down to write, in pleasant poverty and reasonable obscurity, overlooking the very olive grove where Plato so long ago founded his beautiful Academy, my stylus, inkwell, and a lengthy scroll before me there followed an interlude of sheer perplexity. You see, I had been determined to write a history, yet it quickly became apparent to me there was no way to make this story explicable to future generations without telling them exactly what they're reading. It would be impossible to dignify this as a history for in order to write a respectable history one needs access to libraries, and scholars – to unimpeachable sources of information – to records, documents and so forth, and as you will see society has now broken down to a degree that such things no longer exist. So if in this brief preface I could convey a single vision to explain Byzantium in its climactic days, it would be that of a darkened cave thronged with multitudes shouting, scampering hither and thither brandishing swords and idols, chanting garbled incantations, and lashing out at one another in senseless hatred! I'm aware this may seem an exaggeration (the worst possible fate for someone who set out to write a respectable history), but it's the literal truth – (very well, if one only omits the actual cave which is a metaphor drawn from Plato) but an old man must be forgiven a certain degree of metaphor and analogy. So if honesty precludes me from proclaiming “this work” a history then what is it? That's been my conundrum! Neither can I call it a work of philosophy, nor of respect-able scholarship, and I would certainly not claim it to be poetry! So what is it . . .? Finally I concluded there was no precedent for what I was trying to write, so I was ready to give it up entirely. Yet still I felt it was a tale worth telling, so I found that in order to portray the times of our "Most Just, Most Glorious, and most August, Emperor Justinian," I would be forced to create some new kind of writing entirely, a kind of doggerel cobbled together from odds and ends to suit an age of doggerel ...and for this I hope the reader will forgive me. In my perplexity I decided at last to call what follows an “Imaginary History, "knowing full-well that these terms should always and forever be mutually ex-clusive! Even so, as I said, I felt the story was worth the telling, regardless of my limitations, diminishing resources, isolation, advancing age, and simple inherent shortcomings. So lastly I must confess this “Imaginary History” has been drawn from nothing more than personal experience, the testimony of the few who survived whose word I could rely on, and from the paltry remains of the once great Library of the Platonic Academy at Athens. These are the things that happened in my lifetime with certainty, or that must have happened in one way or another to explain subsequent events. As for the remain-der, it is only a vision, a sort of dream of the past I would like to hand down so that those of us who lived it might be remembered for both our triumphs and our failures. Within the long shadow of the Circus Maximus just after sunrise the streets of Constantinople were choked with vendors making their way up the quay, their carts loaded with goods from a thousand ships lying at anchor, with sails furled, pitching in the chaotic swells of the ‘Eurus,’ the brutal wind that blew in from the Sea of Marmara. Two little girls were passing hand in hand through congested lanes above the quay, their scarves whipped by the powerful gusts of the wind. They had been sent out under no supervision other than that of the elder, Comito, to buy fish and spices for a reception. They wore their finest skirts clasped with silver pendants and matching scarves in the deep forest green of their faction. Theodora, the younger of the two at just seven-years-old, was not afraid; she made her way confidently among the peddlers, beggars, soldiers, and courtesans ...amid the sick and the dying through interlocking alleyways thronging with castaways from a hundred cities cast like so much flotsam on the shores of Constantinople. High atop a column of Egyptian Porphyry near the baths of Zeuxippus, a naked man burned to leather from the sun was declaiming an ecstatic litany of scripture into the empty air. While from that air and seemingly from everywhere arose the ringing of chimes, the hum of cicadas, the clapping of castanets from dancers in the foyers, and most memorably for the girls the low resonant timbre of the bells of St. Bacchus – tolling the death of Ezekial, their father. Returning home they made their way through the dazzling ascending sun. with full baskets to their mother's house, a whitewashed and stooped affair of mud-brick in an interlocking warren of whitewashed stooped affairs of mud brick, forming the heart of the congested city. Their front door, made of aged and heavy sycamore darkened from years of sun, was thrown open so that visitors could commune with the dead, their father, the keeper of the bears. His body lay in the front room on a table, adorned with the mantel of the gamekeeper of the greens, while at his side sat a profusion of flowers and candles. Fragrant clouds of frankincense rose from a sensor in the room. Seeing the body the girls hesitated a moment before stepping in. “Come in! Come in! Why do you just stand there you silly girls?" Their mother scolded. "Bring those things into the kitchen and help me dress." 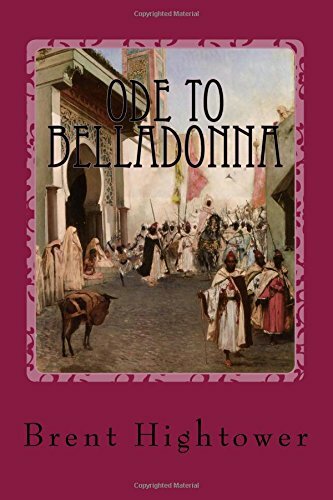 Their mother, Edulica, always impetuous and animated, disappeared into the back rooms of the house while Theodora carried her basket of fish, bulgur, and spices into the kitchen. Thirsty from the walk, she poured herself a glass of watered wine. . .
“Comito! Theodora! Your mother wants you! Didn’t you hear ...?" This time it was their Gothic slave, Ingrid, scolding them. “Get in there and help your mother dress! It's getting late!" Ingrid was carrying their infant sister, Anastasia, who all the while was cried with that desperation of infants who sense that something is different. Theodora then set her glass down and followed Comito to her mother's room at a run. Parting a beaded curtain that served as her bedroom door they found Edulica sitting before an oval mirror of heavy, polished, silver. Myriad cosmetic jars of ivory, glass, and jasper, covered her dresser and the room had its own distinctive scent – one that Theodora would always remember – some singular hint of lemon, cinnamon, and gardenia. Years later, when Theodora was reminded of that fragrance she couldn’t decide what had produced it. Finally she concluded it must have been the scent of her mother herself. Edulica, a renowned beauty known in the family as Li, dabbed carefully from the jars, avoiding her long polished fingernails while slowly bringing her face to perfection. Comito scurried to her side and drew the brush through her mother's long, luxuriant, hair, transforming gradually from amber to a rare and lustrous red. Then she began to braid it with swift and practiced hands. “...And you, Theodora, my earrings!” Edulica said. Taking a key from under her mother’s mattress and opening a drawer of her dresser, Theodora took out the gold Egyptian necklace and earrings that were her mother’s prized posses-sions. There was a catch in her voice as she spoke, but she sup-pressed it, and in moments she regained her customary viva-ciousness, her ever-present determination to instruct her daughters in the ways of the world, even when she herself was struggling against sorrow and uncertainty. When she said this Comito burst into tears . . .
“I must return to the kitchen,” Ingrid interrupted prosaically. When Ingrid had gone their mother held Comito to comfort her, before once again turning her attention to the mirror which faintly altered but in no way diminished her beauty. “You see this mirror?” she said.“ It tells the truth and it lies. As I change my expression I change the way the world sees me, and as I change the way the world sees me I change the world. That is power for those lucky enough to possess it. But never forget that a mirror also lies. Through its reflection we may come to believe that life is beautiful ...It is not. We may be lulled into thinking the illusion it presents is real, and forget that life is nothing but change. That is the truth the mirror hides from us! Her voice faltered a bit again as she finished speaking, but only for a moment. With a great effort she controlled herself. It was an effort she always made before the world, and would throughout her lifetime, an effort that with a single exception seared in Theodora's mind forever, she would always win. . . When her mother's attire was perfect Theodora returned to the front room and stood beside the table where her father's body lay. His face was opaque and waxen, as if made of travertine – as though chiseled from cold stone. He had no expression as he had been in life; no joy, no sadness, no sudden flashes of anger; nor even his habitual anxious smile. Father and stranger he was now to her now even more so than he had been in life. For a full minute she stood beside him, the great ebony crucifix on the wall holding them in mute contemplation. Theodora's life had already been a splendid tutelage in the struggle to survive – in the deprivation and illness of family and friends, in the smoldering warfare in the streets and alleys, in the eternal struggle for a crust of bread. She had watched her father in the ring amongst wild animals and accompanied him to the caves where he fed the bears to be ripped apart by dogs in the circus maximus. Beyond the tenuous safety of home she had scratched among the throng as the family fortunes had turned and turned again, in the innermost heart of the world’s most powerful Empire. The vision was cataclysmic; and the impression that it fostered on such an intelligent girl as Theodora can only be imagined. This vision of her father so recently vigorous and now dead, mingled with that of other things, forming an impression of the world both real and distorted with sorrow. At last a few tears rolled down her face and she kissed his hand. Sporadically mourners began to arrive. The first was Phaon, her father’s assistant. In appearance not unlike a bear himself, being of middle height with dark hair and extraordinarily strong. He was a great hulk of a man with a beard to his waist. He smelled of hay. “How are you, my dear?” he asked Theodora, as he stepped in. She didn't answer, but simply stared through the open door into the blasting wind and the dazzling sun. “She’ll be here in just a moment,” Theodora said abruptly. she was not in the mood for small talk. Then, as if at a curtain call, Edulica stepped into the room. “Ah, Phaon ,” she said. “Thank you for coming, What can I get for you?” Her appearance was in some diminutive way dramatic; her tone that of the consummate hostess. “No, nothing, thank you.” Phaon said. “Just a place to sit if you will. I’m tired. Phaon, who was perhaps the only real friend of her departed husband, responded with a mildly searching look that pro-voked a brief and very uncharacteristic flash of anger from Edulica. Strangely, this response appeared to reassure him; to put him at his ease. Thank you, Li. I think I'll have a coffee after all," he said. “Ezikial was a strong man to die of fever at such an age," Phaon said, "and so suddenly!” (He was careful not to mention the dead man’s name, bad luck before burial), “I’ll miss him, and truly I don’t know what I’ll do without him." “You’ll get by Phaon! We’ll all get by. Somehow. As they spoke the room began to fill with mourners and Edulica broke away to tend to the new arrivals. Conspicuous among them was a tall man, well-fed, with close-cropped brown hair and attended by a retinue. Diagonally across his shoulder he wore a green sash bearing a medal inlaid with emeralds, the seal of the impresario of the greens; one of the two most powerful teams, or more accurately perhaps, fac-tions, that sponsored the competitions in the circus maximus. These rival factions were more important in Constantinople than mere teams; they were also political organizations with real power and sway. It was an amalgamation of athletic and political competition unique to Constantinople, and it added not a little to the great reign of confusion. This man Asterius who had just stepped in had been the patron of Ezikial, Edulica's deceased husband, and as Theodora circulated in the crowd offering guests a tray of honeyed figs. something in his manner drew her attention – an arrogant authority, which combined with the obvious deference he was paid left her feeling ill at ease. His age was hard to guess with precision, he could have been anywhere from twenty to thirty-five; young enough to retain his baby fat, yet his face was sufficiently lined to reveal he wasn't young. A cynical expression also contradicted the impression of youth, and yet he moved with strength, and assurance. His deep-set eyes were intelligent and dynamic as they darted from face to face. “Asterius, how good of you to come!” Edulica said, apparently transported with delight. Phaon stood and left without a word. Moments later the priest arrived followed by church elders, his finery producing a murmur of admiration, and Asterius released her arm. There was another murmur, of approval in the room. “Thank you, Father,” she said. After a moment’s silence at a signal the elders began chanting a profound requiem for the dead. Then, the priest taking the lead, a handsome figure in his wine-red cassock and great shock of white beard, they formed the procession for the dead. Carrying the body suspended on a carpet they wound their way past the old cathedral of St Bacchus amid clouds of frankincense. In light of the dead man’s station there would be no ceremony in the cathedral itself, yet the bells tolled for him as they passed, the procession turning towards the cemetery beyond the western gate. Comito and Theodora kept pace with their mother, to the rhythm of the chanting and the swinging censers amid the throng crowding the lanes. As the procession progressed the ranks of mourners swelled, testifying to the high regard the commoners held for Edulica and her husband. Her beauty and his courage in the ring had made them popular among that great polyglot of the city, speaking Greek though they were Greek, Roman, Hebrew, Gaelic, Slavic, Namibian, Egyptian, Persian and other peoples too numerous to mention. As they went on (much to the consternation of the priests) the women took up the instinctive keening for the dead, that blended with the chanting to make a sound so primordial we share it with the wolves. On them the sun bore down and gulls struggled and danced in the wind, and the spray from waves breaking on the shore of the tempestuous Marmara filled the air with spume. The flowers trailing in their path, the bright dresses, the daz-zling sun – all of these things were nothing to Theodora but an illusion because her mother had told her so and her mother was everything.